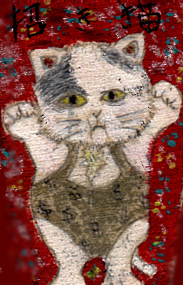 There is an interesting story about the origin of this charm cat. The middle of the 17th century, there lived a priest named Shudo and cat in the temple at Setagaya, the suburbs of Tokyo. One day, Naotaka Li, A famus Lord of Hikone, happenedto pass by thetemple with severalof his soldiers. At the Temple entrance, he sawa cat stting by the road and beckoning with its paws. Attrached by the strange act of the cat, the party entered the temple. Priest Shudo welcomed Lord Li and his soliders, and offered them tea. There was a suddon down-pour of rain with thunder. The cat was struck by lightening, sebsequently died and a stone tablet was elected for it. Lord Li thought the cat must be an incarnation of Kannon Bosatsu (He is known to be full of mercy and blessing, and he will protect and save your soul when the time arrives for him to be savior) as it brought such luck to the temple. The people came to call it the good luck inviting cat. Lord Li offered to build a new one. Priest Shudo named the temple Gotokuji, after Naotaka's pen name. Temple Gotokuji still stands with its good luck.